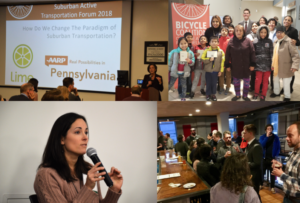 After many months of planning, Bicycle Coalition’s first Suburban Active Transportation Forum was quite a hit! We put together four informative panel discussions, had a wide array of vendors on hand, and a diverse audience of bike wonks and community members alike. Our Saturday morning began with an update from each of the four Pennsylvania county planners on the state of The Circuit Trails and other bike/ped projects in the region. We followed that session with a discussion of how to decode the new suburban bike lane planning process from PennDOT and DVRPC. Our keynote speaker was PennDOT’s Bike/Ped Coordinator Roy Gothie, who discussed the importance of designing roadways for the most vulnerable users: children. Roy was introduced by Yocasta Lora from AARP of Pennsylvania, who highlighted the role that more bikeable communities play in creating more livable communities for all. The afternoon featured a session on how municipal leaders and activists get local bike infrastructure done, and our final session on e-bikes/e-scooters and other disruptive mobility technologies. A theme that arose from the afternoon was the importance of a kind of infrastructure that is oft overlooked: human infrastructure. Phil Ehlinger of Doylestown Borough and Kimberley Bezak of Narberth Cycling Club both highlighted how building vibrant bike culture is a critical step to improving bikeability in a given town. We closed out our evening with a fun happy hour at Conshohocken Brewing in Bridgeport. Tickets to the event included a chance to win an SE Draft bicycle, and we’re happy to announce that the winner is ACLAMO Family Centers. The Norristown organization brought a group of exactly who planners work for: folks 8 – 80! Missed the event but want to see the presentations? We’ve got you covered. Click here. Click here for our photo album from the event. In the coming months, we will begin planning for our next forum, which will be held in November of 2019 in New Jersey. We hope to see you there! Your comment is largely about Vision Zero, which was not really a focus of this forum. 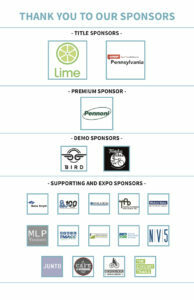 We will be holding a Vision Zero Conference at Temple University in March, and encourage you to attend.